Transition matrices are used to describe the way in which transitions are made between two states. It is used when events are more or less likely depending on the previous events. This is best described in an example. Students have the choice of doing either Math or English during their study periods. 60% of students who do Math during one study period, will do Math the next study period. 30% of students who do English during one study period, will do English the next study period. where n = one state, and n+1 represents the next state. Notice that the column adds up to 1. This is because the numbers represent probabilities and all probabilities must be taken into account. In this transition matrix, the choice of the red or blue pill is influenced by a student’s previous choice. 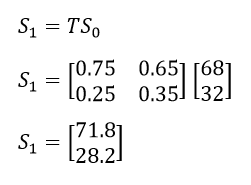 For example, element 1,1 indicates that if a student chose a red pill at first, there is a 75% chance that the student will choose the red pill next. Element 2,2 indicates that if a student chose a blue pill first, there is 35% chance that the student will choose the blue pill next, again. This means that initially, 68 students chose the red pill and 32 students chose the blue pill. In order to predict the actions of the students the next week a new state matrix, , is made. Thee next time the students choose pills, approximately 72 students will choose the red pill and 28 will choose the blue pill. As n increases, one should notice that the number of students to choose either pill begins to settle down to a stable, unchanging number. This is referred to as the steady state solution. To find the steady state solution, reference to the formula must be made. n in this case tends to infinity. Using a calculator, values of n that are greater than 30 frequently give a steady state matrix.